We made these appetizers during the holiday appetizer cooking class I hosted. You can view pictures, the entire appetizer menu and get links to the other recipes from the class HERE. 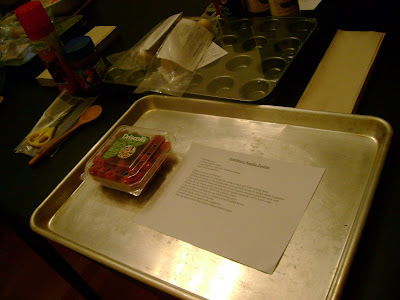 Prepare muffin pan by spraying the inside of each well with cooking spray. Stack phyllo dough on top of each other and cut into 4 equal squares. Take each square and fold into halves until you have a small 2″x2″ square. 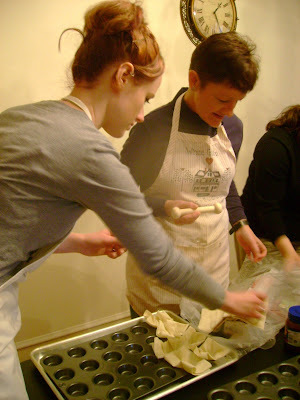 Using the tart shaper, gently push the phyllo dough into each well. Repeat until all wells are filled with a phyllo cup. 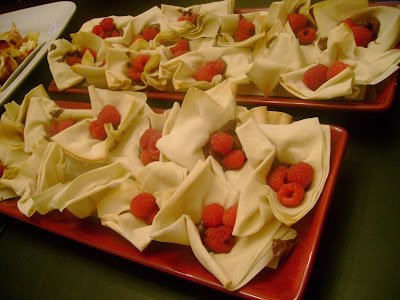 Spray the tops of each phyllo cup with cooking spray. Bake in preheated oven for 2-3 minutes or until golden brown. Fill each phyllo tartlet with nutella. Top each with fresh raspberries.